Everyone has a bad hair day now and then. 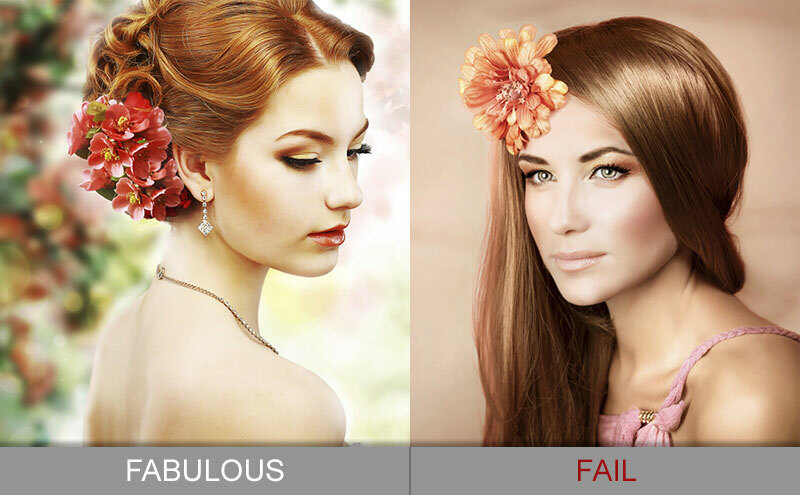 A few tricks of the trade can help turn those fails to fabulous. Unless you are a very young girl or in a remake of Revenge of the Nerds, pigtails should never be tied above the ear. Trendy and youthful tails are tied below the ear near the jawline. Avoid a center part: off-center and side parts soften the style and make it fashionable. When coloring your hair in a contrasting color, keep the contrast a somewhat natural color like auburn or blonde. Hot pink and other bright shades should be used as a pop of color that hides in your hair and not at the front of your hairline. Sticking with a natural shade will change "Whoa" to "Wow!" Use a texturizing cream at the roots pushing the hair up and back. Let the hair fall between your fingers and lift the ends out from the head. Use your fingertips to move the hair on the top so it looks piecy. A light mist of hairspray is optional. Sponge spiral curlers will give you a natural looking set. These are used on damp hair and can be slept in to air dry (or use a hood hair dryer). 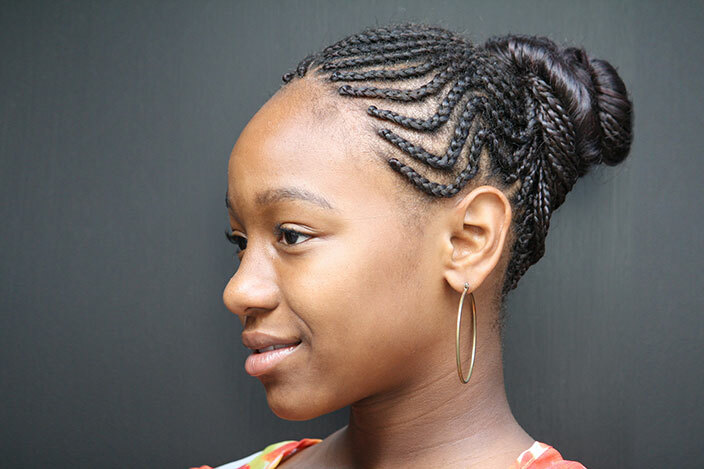 Professionally done spiral perms look natural on hair that is layered and not longer than shoulder length. Use a 1/4 inch or 1/2 inch curling iron and spiral your hair around the iron. Shake out the curls with your fingertips to separate them. If you comb or brush the curls you'll end up with a large flat spot on the top of your head, making it look like you fell asleep facing a wall. Don't do this. An angled cut is best worn with hair that is all one length, and styled with a flat iron with the ends slightly curled under. This style is fabulous on straight or straightened hair. Choppy layers with dry, uneven ends tend to make it look like Edward Scissorhands is your personal stylist. Hair ornaments can look fantastic - in moderation. Medium to large flowers are elegant and stylish when worn next to each other to look like one piece toward the back of the head. Butterflies can also be lovely, but you want to stick with one or two, not an entire extended family. Just because a dozen ornaments come on a card doesn't mean you need to wear them all at once. Tight spiral curls are best left to nature. They are easier to moisturize and care for than a tight perm, which can leave the hair frizzy and looking over processed with uneven curls. There is no bigger fail than hair that is fried, dried, and laid to the side. If you don't have natural curls, try curling your hair with sponge type spiral curlers that bend. These curlers give a much more natural looking curl than perms. For the perfect copper red hair, consult a professional. Extra red pigment can be added to their mix of colors to achieve the perfect bright copper. Box colors found at drugstores can turn your hair brassy or orange if you don't understand how color works with your natural hair. This pictured fail is a prime example of a blonde using a copper box color - and perhaps skipping her leave-in conditioner. An athletic headband makes more sense on the ball court or a track meet than at the office. When choosing a headband, opt for one that has a style to it, such as this braided one, rather than a plain piece of cloth. Chic headbands are more narrow and have a design. They are trendy as long as they match your outfit. Avoid the 1970s gym class flashback. They didn't look good then and they don't look good now. Placement is key when wearing large flowers. They are stunning and elegant off to the side of an updo. A dainty flower, such as baby's breath, clipped in with a bobby pin wears well just above the ear. Larger flowers should only be worn at the back of the head to the side of a braid or updo. They do not belong on your front hairline unless you're an infant. While organic pieces added to the hair can be pretty, grains and weeds are not. Wreaths for your hair should not be actual wreaths like you would put on your front door. Make the wreath fabulous by braiding your hair from side to side and working small flowers into the braid. The failed attempt at this style is enticing, but only to bees. Updos that are worn high should not be higher than the crown of your head. This fabulous chignon-style bun placed at the top of the occipital bone is finished by wrapping a small braid around it and adding a beautiful hair accessory. Updos should never be worn on the top of the head. Think Cinderella, not one of her wicked stepsisters. An elegant and stunning updo should have large curls pinned and woven around each other. A center part in the front and soft sweeping sides make for a fabulous style for any special occasion. Haphazard twisting and pinning makes for a lumpy, harsh look that borders on frightening. No matter what style you go for, taking care of your tresses is imperative. Understanding what your hair needs and how to care for your hair will always make your style more fabulous.